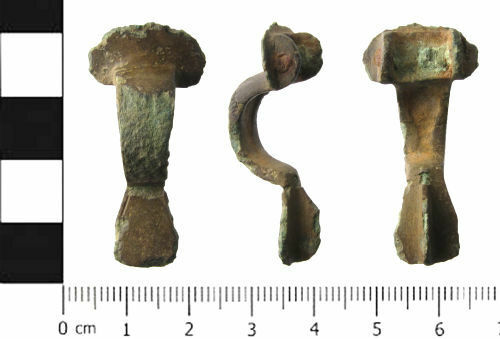 A cast copper alloy Roman brooch, dating from AD 100 - 400. It is a variant of the knee brooch type with a plate like head (the edges are broken so the original shape in unknown), a short bow and a fantail foot. Head, bow and foot are all of rectangular section. There is no decoration. On the underside of the head are two semi-circular lugs. These are pierced to take the pin bar. The remains of a ferrous pin bar can be seen in both of the lugs; the pin and bar itself is missing. The remains of a catch plate are also visible on the underside of the fantail, running its full length. The brooch has a smooth, dark brown patina, missing in places. It is 38.7mm long, 18.5mm wide and 17mm thick. It weighs 5.56gm. Similar brooches are illustrated in Mackreth, 2011, Brooches in Late Iron Age and Roman Britain, volume 2, plate 131, numbers 7694 and 7705, also in Hattat, 2000, Visual Catalogue of Ancient Brooches, figure 193, number 1224.